It seems the era of accessing content from around the world on Netflix is coming to an end but we’ve got some tips for you to circumvent these error messages you may be getting. 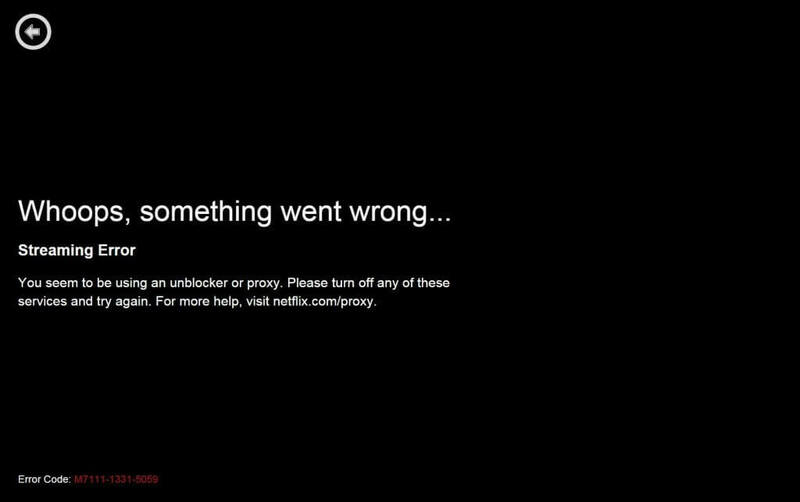 If you’ve gotten the message ‘Whoops, something went wrong… Streaming Error – You seem to be using an unblocker or proxy. Please turn off any of these services and try again.’ along with the Error Code : M7111-1331-5059 then listen up as the information below on what to do next. If you’re confused by the messaging or what the heck is going on, you need to understand what Netflix is doing to combat proxy unblockers and why they’re doing so. Their own help page surrounding the issue is incredibly vague and simply asks you to disable your unblocker. So let’s rewind a bit and see how we got here. 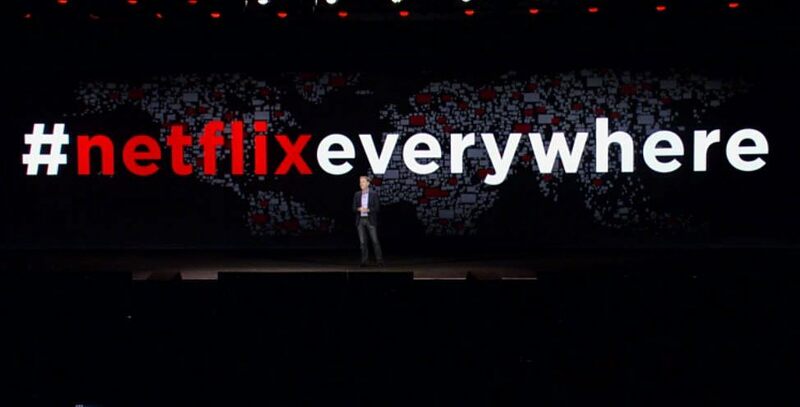 Netflix started up in the US as a streaming service a number of years ago and ever since, has been steadily expanding across the globe into different regions. With each new regions comes new restrictions on which content they can and cannot stream in that area. Even their own Netflix Originals sometimes come up against other contracts in place in some regions. All of this leads to different regions being able to acquire content and some regions not being able to stream that particular piece of content. This means that using simple methods of avoidance would allow you to jump to another region to enjoy their content library. Up until earlier this year, Netflix never really condoned or advised against this technique, opting instead to avoid talking about it all together. But, with an announcement of imminent worldwide expansion, content holders were inevitably nervous about opening up their US contract to say someone from Spain using an unblocker. This pressure from content holders has been mounting for years and came to a head this year where Netflix vowed to stop people jumping regions, hence the reason you have that message and the reason you’re now reading this. My proxy/unblocker has been blocked – what should I do? The first thing you need to do is remove your blocker as it’s going to keep getting caught over and over. This sometimes easier said that done, the first stage of getting Netflix back is by removing your unblocker. In most instances, you should just be able to use the installation guide provided by your proxy or unblocker service. Given that most just add DNS settings, resetting your internet on your devices back to the original settings by removing them and starting over should do the trick. Some more aggressive ones may require you to remove their programs or manually remove them from your system. You can then try reinstalling your unblocker but you may be met with limited success. 2. If you’re paying for the service using to unblock Netflix, contact them. Most people jumped onto paid services to unlock the potential of their Netflix subscriptions. If you’re one of these peoples and are in monthly or paid upfront for annual subscriptions, you should get in contact with those companies immediately. They will help give you guidance on their work around for the block but if they aren’t co-operative or no longer offer support for Netflix, you need to request a refund or a cancellation in your subscription with them. While many companies that provide these services are no longer advertising that they support Netflix, some claim to have gotten around the blocker but with mixed results. The most sound way of getting around these blockers at the present time is by using peer-to-peer methods such as Hola. While using this method does carry some risk and the fact even P2P is being blocked in some cases, it’s probably one of the only ways to get around the blocking at this time. There are also communities, such as the one on Reddit, dedicated to getting around the proxy blockers. This is obviously not the best case scenario and it’s also a rather simple solution but as the saying goes, vote with your wallet. If Netflix’s bottom line is hurt by the amount of people leaving because of the proxy block then they’ll have to act. Conclusion : Will 2016 be the end for unblocking other Netflix regions? Next story When will Part 2 of The Ranch come to Netflix?